We have achieved < 200 PC partial discharge reliability in the Pocatello plant. Partial discharge level is a measure of design capability, quality of materials, workmanship and environmental state of the plant. This goes beyond passing the IEEE tests to demonstrate long term reliability of our transformers. We have passed 13 units in a row at GTC – two of these were 345 KV. The largest one of the 12 is 220 MVA. It is a source of pride that VT-GT is one of the few plants that can produce 345 kV units in the USA – most >345 kV units are shipped to the US from elsewhere in the world. We are fully leveraging the plasma table in the control box assembly shop in Troutville, VA for making cutouts in the back panels for the cabinets – take a look at the “cleaner cuts” in our metal work and you will see the difference! The particle count in all plants have reached the level of the GTC plant. GTC sets the industry standards because it is a completely sealed atmosphere. The other plant teams have stepped up to the challenge of mastering the art of controlling particle counts through diligence, hard work and exceptional attention to detail. Our hard work has paid off in the past 18 months, resulting in eliminating single point of failure of equipment at all plants. Any equipment issues can now be resolved within 24 hours. Preventive maintenance and stocking of spare parts are the foundations of this program, maintaining our schedule of on-time performance. We are achieving 100% Ready to Ship (RTS) orders in our 4 plants for continuous several months. 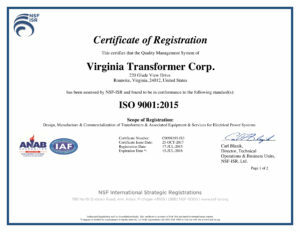 YTD the First Pass Yield (FPS), where a transformer passes all the tests the first time, is exceeding 95% in aggregate for all plants. Recently a surveillance / upgrade audit has been completed to upgrade our Roanoke / Troutville plant’s current ISO9001:2008 to ISO9001:2015. We appreciate the diligence of our internal auditors in achieving this upgrade.